We live in the middle of the most competitive and exciting business environment in human history. Seriously. It’s possible for anyone (ANYONE) to create an online business with nothing more than a dream, a laptop, and an internet connection. This means you too can compete against every other business on the planet. However, if you’re going to have any chance at succeeding online, you’re going to need to make sure that you are aggressively and intelligently marketing. This usually means having a great plan in place and turning to tools like social media and other online marketing solutions to improve your more traditional marketing results. The issue is that this is tremendously time-consuming. While entering the market is easy in comparison to the past, this means tons of other people are doing the same. The competition is fierce, and time will become your most valued and scarce resource. This is why you need to take advantage of social media automation tools and really try to figure out how to properly automate social media marketing for your business. The issue is how to automate without losing that personal touch; how to automate and still be effective. If you’re able to pull this off, you’re going to have a much better chance to dominate the marketing scene for your industry and yield an ROI. The key is learning how to automate social media and not look like a spammer. If you’re really serious about using social media automation tools to your best ability, you’re going to need to create content that is consistent across the board. The overwhelming majority of small businesses out there are just kind of winging it when it comes to marketing online, especially in the social media sphere. They throw up anything and everything they think of, diluting their brand along the way, and just kind of hoping for the best. You’ll never be able to enjoy good social media automation results if that’s the kind of approach you’re going to take. Instead, you’ll want to be able to quickly and effortlessly create consistent content that really helps to build your brand and your messaging – giving you every edge and advantage over those “throw it at the wall and see what sticks” style marketers. If you want to work on a content strategy, first you need ideas. BuzzSumo is a great place to get content ideas. Simply hop on their website, enter the name of your industry or a relevant topic, and BuzzSumo will come back to you with the hottest pieces of content on that topic. This is the stuff you should be writing about. Now that you know where to get your content, you need a way to disseminate your content. You can use any number of social media dashboards (like Socialdraft). If they offer a category system, this is even better. Each time you create a post, add it to a category. When you need content, simply bring up that category and duplicate this content. Make sure to space out this duplicate content so that you don’t bore your audience. Look at your analytics. Check the best posting times for all of your social networks. Then, make sure that you schedule your posts for those times. If you’re using a social media dashboard that analyzes this for you, let them do that job for you (we do that with SmartID). These systems analyze your best posting times and schedule at these times for you. Another trick to help you figure out how to properly automate social media marketing is to forget almost completely about day to day tactical stuff and instead focused on your grand and over arcing strategy. If your strategy calls for finding the best-qualified prospects for your business and spending as much money as possible to get them into your funnel, you’ll then know exactly which strategies should prove to be the most beneficial in helping you do exactly that. Start off with tactics first, and you’ll find that you are really struggling to gain any traction whatsoever. Everyone is going to have a unique strategy that they are focused on when looking to leverage social media automation tools, and it’s going to be dependent entirely upon your sales goals and your business goals. Take a weekend to really try and hammer out a concrete goal that you’d like to achieve – a measurable goal that you can track your progress towards – and then build strategies and tactics to get there. Though it is certainly possible to create a truly automatic social media account that works without any intervention on your behalf whatsoever, you’ll never be able to remain truly relevant or gain the kind of influence you need to succeed today if you go this route. Good social media automation is all about remaining flexible to post at a regular intervals in conjunction with your automated system, giving you the ability to take advantage of opportunities as they come down the line. Smart and savvy marketers understand the power of flexibility and leverage it at every chance. You’ll want to have a backbone of truly automated social media, but you’ll want to augment that approach with flexibility as necessary to really help you achieve the goals that you have been pushing forward towards. At the end of the day, automation is only going to help you as much as you take advantage of it. Automate the things that would have otherwise crushed your time and then spend that time wisely on high impact efforts. Your business is only going to benefit from the proper implementation of social media automation tools. If you have international followers in different time zones, schedule several tweets at different times a day. Even if you tweet the same content, you’ll be reaching a different audience. And this is a great way to kick out content when you’re pressed for time. Automation is a great tool, but the last thing you want is for people to think your social media accounts are robotic. That’s why it’s so important for you to interact with your fans and customers. Spend some time each day to answer questions and leave comments in order to personalize your social media accounts and instill trust in your brand. You obviously wouldn’t want to recycle a time sensitive post from 2012, you could post older content that was popular and is still relevant. You could use a WordPress plugin like Revive Old Posts to recycle your top posts on a schedule. While social media should not be about numbers, but a targeted community, you do need to keep your account clean. If you’re following a ton of people who are not following you or engaging with you, you should clean those up and move onto a community that could yield you an ROI. Use a tool like InsTrack, it will show you those who are not following you so you can make a choice as to whether you want to continue following them or not. 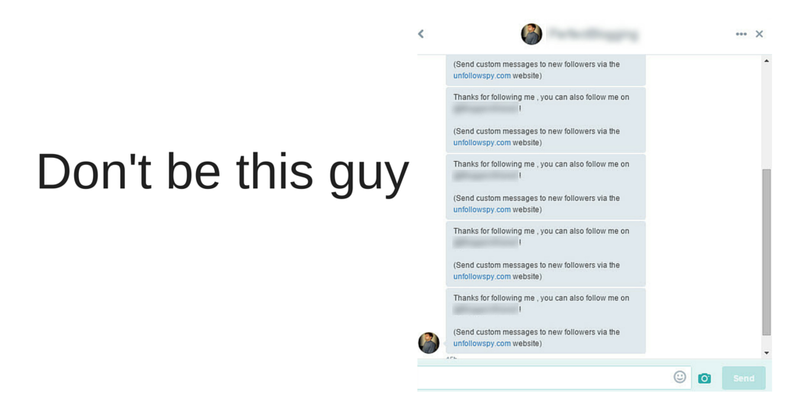 Auto DMs: these are the most annoying form of social media automation. Most people who auto DM are immediately unfollowed. These messages don’t work because they are impersonal. It’s as bad as email spam. If you’re going to message someone on social media, personalize it so they know you took the time to think about them. This will go a long way and set you aside from the pack. Auto-replies: If you are using those tools that allow you to set up a specific keyword search and a tweet to reply any time that keyword is mentioned on Twitter, stop. Why? Because you’re missing out on sentiment. Your auto-reply could be completely unrelated to the tweet. This will not yield an ROI and will leave a bad taste in your community’s mouth. You don’t want to be branded a spammer. You should absolutely be tracking keywords (you can do this in our alerts tool), but for this type of thing, it is best that you screen the messages and reply to those that are truly relevant to your business. Cross Posting: I know…we just said you should cross post above. However, this is not the case with Twitter. Twitter and Facebook are completely different landscapes, and content that works on one does not work in the other. Tweets don’t make sense on Facebook, and Facebook posts are too long and cumbersome for Twitter. Instagram should be 100% original…you get the idea. So if you are going to cross post, make sure you do it intelligently. Besides, if your audience is following you on multiple networks, they are going to get bored of seeing the same content across multiple platforms. Don’t Set It and Forget it: This is the absolute worst thing you can do. Imagine a national disaster happens and you’ve got scheduled posts that are insensitive to this. While you should absolutely schedule and automate, you need to be vigilant over your accounts in case of unforseen circumstances.